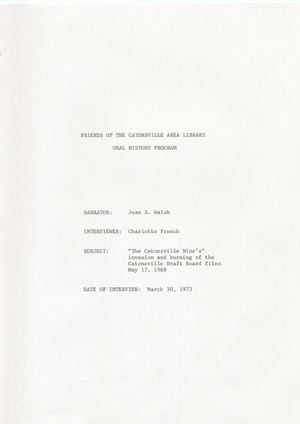 The Catonsville Nine's invasion and burning of the Catonsville draft board files: an interview with Jean S. Walsh given on March 30, 1973. A transcript of a recorded interview with Jean S. Walsh, the editor of Catonsville's local newspaper, the Catonsville Times. She was present at the scene after the burning of draft records in Catonsville on May 17, 1968.